I love the blending of linen fabric, with quilting cotton. I see little projects in quilting magazines and books now with this look and I love them all. I made up this little prototype drawstring bag this week using some leftover drapery linen that I bought to make a cover for my calendar earlier this year. Also, I've been using my old pinking sheers more lately. 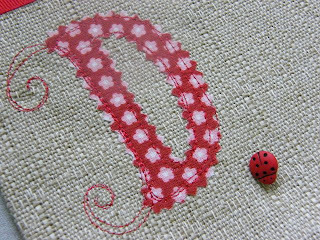 I "pinked" out this "D" from fabric that I had fused recently. Then ironed it to the linen and machine quilted over it to secure it. 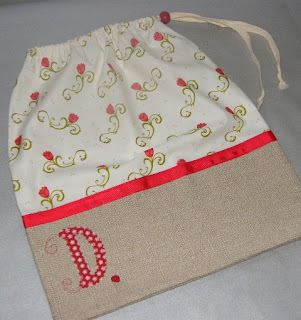 Now, who do I know that has a "D" initial, that I can give this to? Does it look like snow? Last week I used my frixion pen to draw the snowdrifts. Yesterday it took me 10 minutes to machine quilt it. Now I'm deciding what to quilt on the checkerboard border. I really like it. 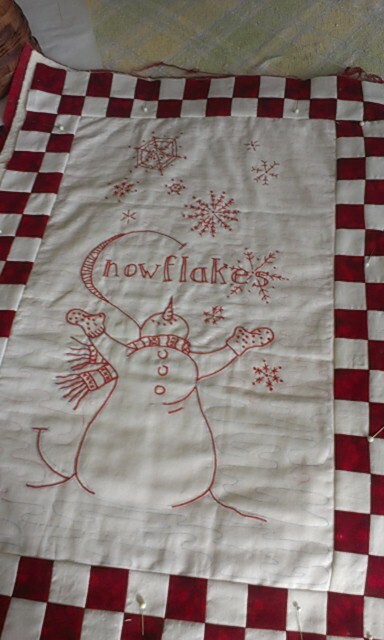 This this pattern is from Crab Apple Hill Studios and this particular block is the "S" block from Snowmen A - Zzz. My friend Vivian gave me an Amish Cinnamon Bread starter last week. The starter was a cup of special batter in a zip-lock bag. The instructions that came with it explained in detail, how I was to tend to it for 10 days. Mid way through I had to add more ingredients, then mush daily, and now it's day 10. I get to divide my starter and make my two loaves of cinnamon bread. PS: It's cooked now.. It's delicious. I strive for 10,000 steps a day. My first 6000 steps are easy. 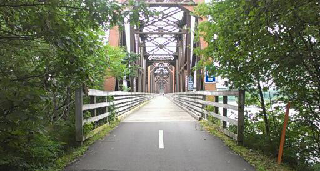 I love to walk our local train bridge, now converted to part of the trans Canada trail system. I have no idea if I achieve the other 4000. I don't think I do. It's only 5 steps from one side of my sewing room to the other. 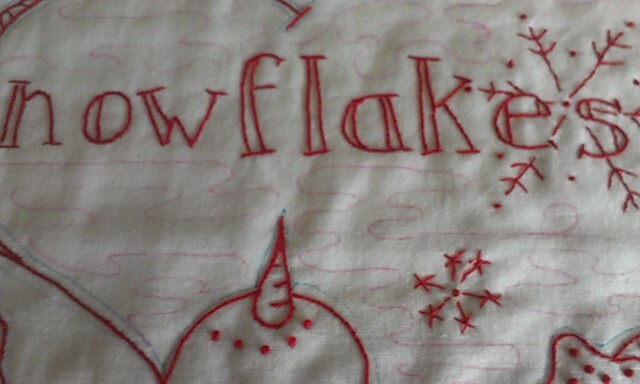 My little snowflakes embroidery is so cute. I decided to put a red checkerboard border on it, and after it's machine quilted, I'll simplyfinish it with a red binding. For now, I did take advantage of using my FriXion pen to lightly mark the lines where I will machine quilt. I don't usually do that, but since I wanted the look of snow, I thought a little pre-planning would be helpful. 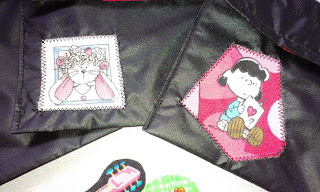 After I machine quilt it, a simple passing of the iron will remove any marks. Stay tuned, I'll show the completed project to you next week. Brewing a coffee to make an iced caramel coffee later. 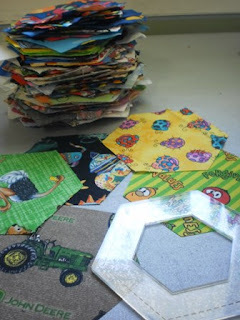 After cutting hexagons out of some I spy fabrics that my friend Lucy dropped off for the school project last week. I was left with some bits that were too small to cut more hexagons out of, but too good to throw away. 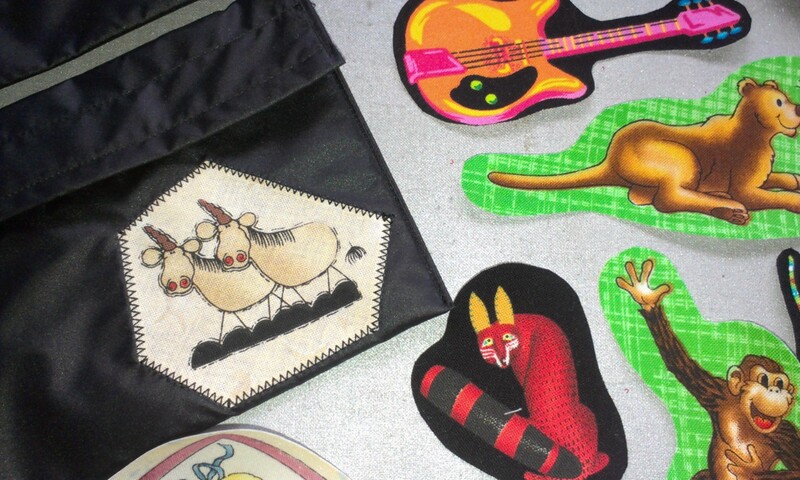 So I made some small patches out of them. I simply trimmed out some of the fun characters and laid them face up on a piece of paper backed fusible. Then I put a piece of parchment over it and ironed them to the fusible and cut them out. Today I used up five of them. 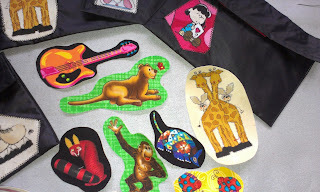 I lightly ironed them to some snack bags that I was making and zig-zagged around them to secure. 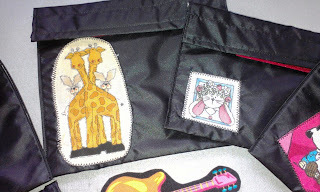 I have several more made and I'll save them for other projects or simply patches on the kiddo's blankies... Cute, eh! The Cotton Mill Quilt Guild is making a large size "I Spy" quilt for the new elementary school that will open up in Marysville in early 2013. We have gathered fun fabrics from members and friends of the guild. We now have over 200 hundred hexagon blocks cut. We have some great fabrics, but because it's a school project we want to include some notable New Brunswick things. We have a great chickadee, which of course is the New Brunswick bird. One thing we are missing is a good violet fabric. And I wonder if there is any such thing as fiddlehead fabric? I still have a few members stashes to go through in search of violets, but if you happen to have a small piece of violet or fiddlehead fabric or other important fabric that you would donate, we would really appreciate it. I hope you all enjoyed our fabulous Canada Day weekend. It's amazing how beautiful weather just helps! Since it's now July, I'm more determined than ever to finish my Christmas in July project from last year. 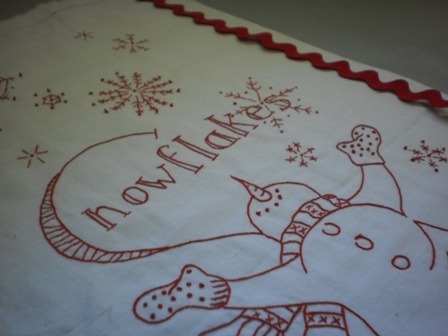 It's my Winter Wonderland stitching project of course. All the hard work is behind me. All I have to do is the blocks that surround the stitched center. Easy Peasy... except for the fact that every block is a different size and uses different fabrics.. oh, well. If I do a block a day, I'll have it done by the end of the month. Check back on July 31st to see if I've met my goal!! Meanwhile, here is another little stitchery that I'm just finishing. I'm auditioning red rick rack as an embellishment to the border. Cute, eh? This is the letter "S" block from the Snowmen A to Zzzz pattern.